The largest delivery and warehouse terminal building between New York and Chicago, currently known as the River Walk Corporate Center, is now The Highline; one of the largest riverfront development projects in Pittsburgh. 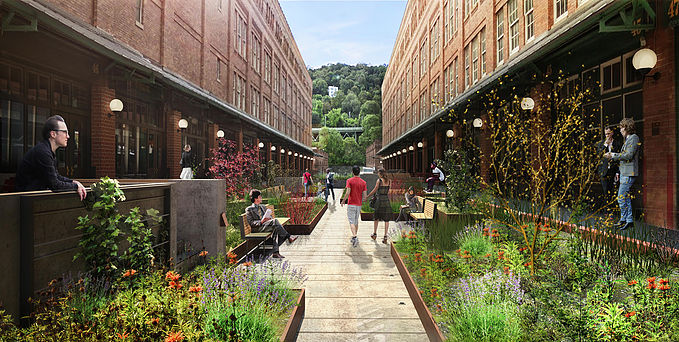 The adaptive reuse provides a connection between the modern tenant-focused workplace and Pittsburgh’s historic built environment. This historic six-story structure will contain 500,000+ square feet of new creative office space including new common areas and fitness centers. The site will also include 100,000+ square feet of supporting retail and an acre of public riverfront green space. BranchPattern has provided services to guide the pursuit of LEED v4 Core & Shell certification, including developing strategies appropriate for a multi-phased, multiple building project site. ASHRAE compliant energy modeling was also performed to analyze and document energy reduction strategies. This space is currently home to Friends of the Riverfront, Allegheny County Conservation District, and the Green Building Alliance and is listed on the National Register of Historic Places. Future plans look to make the space even more bike and pedestrian friendly by reconnecting with the Three Rivers Heritage Trail which currently detours around the Terminal Building.